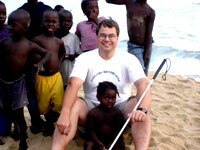 The seeds for Lifewater Canada's founding were planted in 1987 when I was diagnosed with Retinitis Pigmentosa (RP). This progressive degenerative disease can not be treated and results in night blindness, tunnel vision and eventual blindness. The plan for my life had no room for this disease. After getting over the shock of this diagnosis, I faced my mortality head-on and decided that I could not wait until I retired to put my faith into action by reaching out a helping hand to those in need. How exactly this would happen is an on-going adventure of discovery. In 1989 I spent time with Development Workers in the Philippines and in 1991 helped build a church in Honduras. In both places I was struck by the fundamental importance of water and was shocked to see children dying because they had no safe drinking water. I also did not fare well as a construction worker... making mistakes like setting the skill saw blade too deep and running it through the concrete block under the 2x4 I was cutting... wrecking the only blade in the town we were working in! The other workers encouraged me to find a new volunteer activity and I began pondering options for sharing my expertise as a Hydrogeologist. In 1993 I worked with local drill teams in Kenya and in 1994 met a Liberian Pastor who shared that it was pointless for him to talk about the love of God when children were dying because they did not have safe drinking water. In 1995 my friend Glenn Stronks agreed to go to Africa with me. 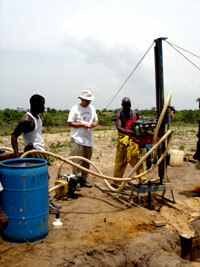 We ordered a portable drill rig, shipped it to Liberia, hosted a 3-day water conference in the capital city and trained 12 local people how to construct wells. Our plan was to drill two wells and never return to Africa but leave the Liberian trainees to drill wells for villages in need. While in Liberia I heard that someone back home had generously offered to pay for the drill rig... which was really good because I was so busy focused on the job at hand that it had not ever occurred to me that the rig had to be paid for! We met the Liberian President who asked us to please return to help Liberia and her people, we wept as we saw children drinking water from street gutters and stagnant ponds and we talked to exhausted Doctors who told us that they were overwhelmed treating preventable, water-borne diseases. We came to realize that the men we had been training were on subsistence existence and could not take time off from their daily struggle to feed their families in order to drill wells for others. As we began walking in the shoes of the villagers we were helping we also came to realize that people earning $1/day could not afford the $4,000 cost of a well and pump unless we subsidized the cost to make it affordable. Just before leaving Liberia we hired 6 of the workers, paying them out of our own pocket. We could not leave the country unless we were confident the drilling would continue because to do so was giving a death sentence to many of the beautiful children we had met. We began sending sharing our pay cheques with Liberian villagers to help make them cover the cost of obtain safe drinking water. With the support of families, friends, corporations, churches and schools we continued to drill wells in one village after another and in 1997 Lifewater Canada was officially incorporated. To-date, Lifewater supported crews have successfully completed hundreds of wells and washrooms, benefiting tens of thousands of African children and their families. We remain a grass-roots movement that brings together people that believe that whether children live or die should not depend on where they are born. We now need to raise $1,500/day... a daunting, scary task for a small group of committed volunteers, but we continue to be privileged to experience the generous support of people we have never met who give what they can and enable this work to continue.